A federal judge ruled Thursday (Sept. 28) that Black Lives Matter is a social movement and therefore cannot be sued. As reported, the decision arrives after a police officer anonymously filed a lawsuit last year after being injured by a rock during a protest in Baton Rouge. The lawsuit, which was filed against Black Lives Matter and activist DeRay Mckesson, has officially been dismissed, with U.S. District Judge Brian Jackson ruling that Black Lives Matter is not an entity that can be sued, much like the Tea Party or the civil rights movement. "Although many entities have utilized the phrase 'Black lives matter' in their titles or business designations, Black Lives Matter itself is not an entity of any sort," Jackson wrote in the ruling, which spans 24 pages. The judge also concluded that Mckesson "solely engaged in protected speech," during the July 9, 2016 demonstration, which took place following the fatal shooting of Alton Sterling, 37, who was shot six times outside of a convenience store where he was selling homemade CDs. As previously reported, the US justice department chose not to bring charges against the two white officers involved in the incident, which took the life of the father of five, despite the shooting being caught on video. Mckesson was one of nearly 200 protesters who were arrested after Sterling's death. He has since reacted to the verdict dismissing the suit against him and Black Lives Matter, sharing in a statement that not much has changed in the past year. "It's clear that I did nothing wrong that day and that the police were the only violent people in the streets," Mckesson stated, after learning of the ruling. "The movement began as a call to end violence and that call remains the same today." The lawsuit, which was filed anonymously to "protect" the officer, claimed that Mckesson "incited the violence" and was "in charge of the protest." 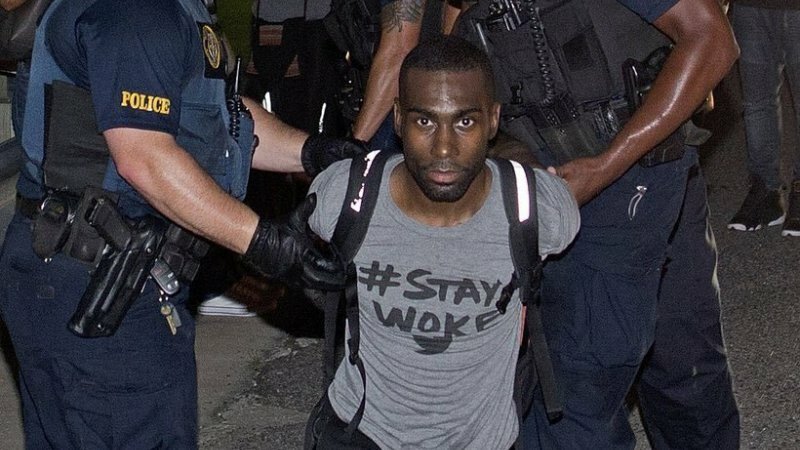 Take a look at Deray Mckesson reacting to the news below. I just got the good news that one of the lawsuits against me from an anonymous Baton Rouge Police Officer was just dismissed by the judge.